Do you want to admire famous sights in New York from a unique perspective? Then book a helicopter tour and get ready. Whether this is your first or 10th visit, a helicopter flight is a thrilling opportunity to see this great city. The aerial views of famous attractions are something you’ll have a hard time forgetting. If you are not sure which tour to choose, don’t worry. We’ve selected these 11 tours to help you narrow down your choice. Do you want to enjoy a genuinely birds-eye view of New York City? Then choose between several departures during the day and hop aboard. Soar into the sky for fantastic photo opportunities of Statue of Liberty, Chrysler Building, Empire State Building, Brooklyn Bridge and Central Park. Admire once-in-a-lifetime views as you fly over Ellis Island and Manhattan. If you choose the tour which includes all taxes, fuel and service fees, you’ll be able to enjoy the live commentary on board. However, keep in mind that passengers weighing over 113 kg (250 lbs) would have to purchase an additional seat, or may be unable to fly due to comfort and weight balance of the aircraft. This helicopter tour departs from Kearny, New Jersey Heliport. You can come by yourself or upgrade to include round-trip transportation to and from the New Yorker Hotel (34th and 8th) by private sedan or SUV. After a safety briefing, you’ll take off. When you enter Liberty Harbour, you’ll have a chance to take great pictures of Lady Liberty, as well as Ellis Island and Governors Island. Your pilot will tell you interesting facts about New York’s iconic landmarks. Take in the views of Battery Park, Manhattan and Williamsburg bridges, remarkable Brooklyn Bridge and Staten Island. It can be a great romantic experience or an adventure for the whole family. Children who weight less than 15 kg (35 lbs) can ride for free but have to be on a parent or guardian’s lap. Helicopter flight; Experienced and professional pilot; A ride to and from the New Yorker Hotel including gratuities (if option selected). 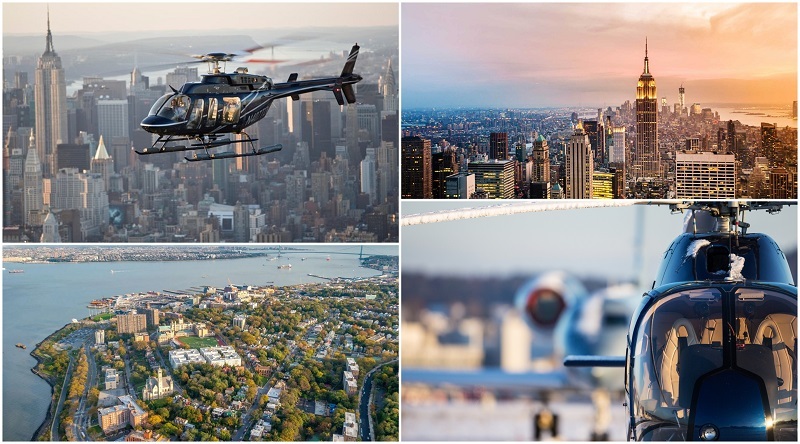 Pair a helicopter tour with a cruise of New York Harbor, and get fascinating views of Manhattan both from the sky and the water. Head to the Downtown Heliport located at Pier 6 in the morning or the evening. Board a luxury helicopter and prepare to be amazed by the views. 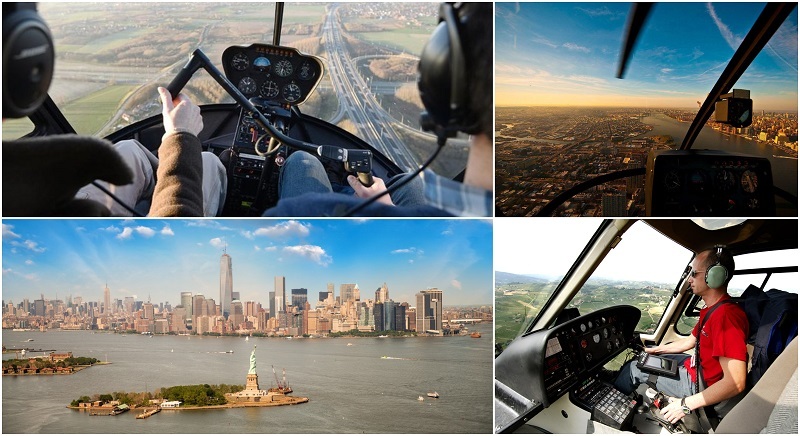 Your pilot will tell you interesting anecdotes as you soar over the Brooklyn Bridge, Statue of Liberty, iconic Empire State Building, Central Park, Chrysler Building, and the Goldman Sachs Tower. The flight is followed by a cruise of New York Harbor. Choose between Champagne and a Mimosa, and enjoy captivating views of Manhattan skyline. Helicopter tour; 1-hour boat cruise; complimentary glass of a Mimosa or Champagne on the boat cruise; Helicopter fuel surcharge and heliport fees. 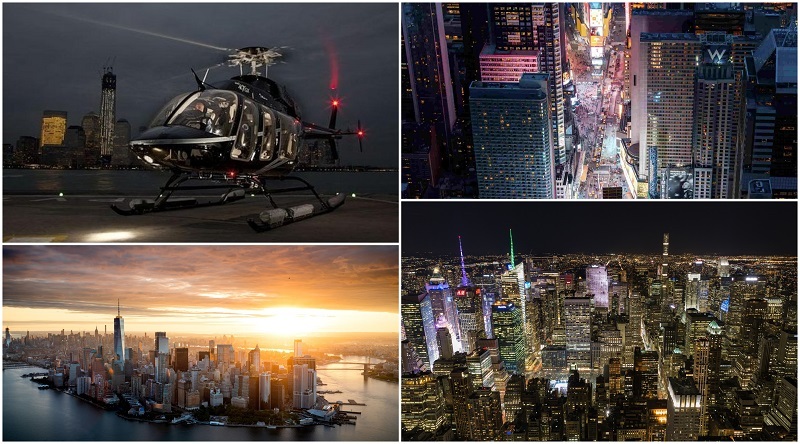 Experience New York’s fantastic skyline on this helicopter tour, and get the best view of the city. Choose between several departures during the day and admire a birds-eye view of Manhattan attractions. Fly over Central Park and the Brooklyn Bridge, Empire State and Building, and Rockefeller Center. Come face-to-face with the Statue of Liberty, and fly past Ellis Island. Enjoy the views of bustling Times Square, check out the George Washington Bridge, Yankee Stadium and the New Jersey Palisades from above. Listen to live commentary on board and don’t forget to take pictures. This comprehensive tour will give you the opportunity to see the entire New York City from above. You’ll see the most famous sights as well as some less known, but interesting and beautiful. Fly over the Governors Island and get a close-up of the incredible Lady Liberty. Admire the beautiful Central Park without dealing with the crowds. Take in city’s skyline including the Empire State Building, the Met Life and Chrysler Building. You’ll fly over the Yankee Stadium, George Washington and Brooklyn bridges, Hudson River and Ellis Island. Flights depart all year round, but times are approximate and subject to change. See all distinguished New York’s sights illuminated at night. Hop aboard 6-passenger Beli or 7-passenger high visibility Airbus helicopter and get ready to experience the magnificent city’s skyline. Fly past Chrysler and Empire State buildings, Rockefeller Center, and UN Headquarters. Enjoy views of Central Park, SoHo, the Met, the National 9/11 Memorial, and the bustling Times Square. Although this tour is wheelchair accessible, it requires good weather and a minimum of four people per flight. Don’t miss your chance to be dazzled by New York city lights. Heliport Landing and facility fees; Headsets to hear the guide clearly; Live commentary on board; Fuel surcharge. Take in the views of the Brooklyn, New York City and New Jersey as you fly past some of the world-known attractions. Head to the heliport in Downtown Manhattan. Let your pilot know what would you want to see, and he’ll design a unique route and make this a once-in-a-lifetime experience. Enjoy the views of the Statue of Liberty, New York’s bridges, Coney Island, the Empire State Building and the MetLife Building. Fly over Central Park, catch a glimpse of Yankee Stadium, Hoboken and Jersey City. This experience will take your breath away. Private 30-minute helicopter flight; Experienced and professional pilot; Heliport/Security fee. A helicopter tour which includes dazzling views of the New York skyline can be a romantic experience too. Choose between afternoon or evening flights and plan a date with your significant one. A private helicopter will take you from Westchester Airport, over Tarrytown castles and Hudson Palisades to the famous New York city sights. Cosy up to one another and Admire the views of Central Park, Yankee Stadium, the George Washington Bridge, the Empire State and the Chrysler buildings. If you want to see Lady Liberty up-close, as well as Times Square, Battery Park, Ellis Island and the Freedom Tower, upgrade for an extended tour. You can arrange your own transportation or upgrade to include a round-trip transfer from Manhattan. Create unforgettable memories and let New York charm you. This is undoubtedly the experience which will be the highlight of your trip. Admire stunning aerial views while riding in style and drinking Champagne. 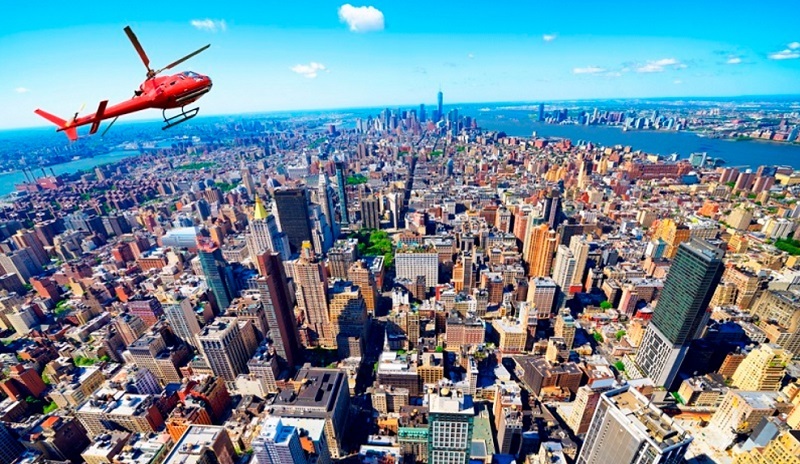 Head to the Midtown Manhattan heliports, and choose between several departures during the day. Fly between the Statue of Liberty and Yankee Stadium, and directly over other major attractions including the Empire State Building, Central Park, Hudson and East River, Madison Square Garden, Freedom Tower, and the unforgettable Brooklyn Bridge. If your group has up to three passengers, you’ll ride the Robinson R44. For larger groups (up to six passengers) there is the Airbus AS350 helicopter, and also a luxury twin-engine Airbus. All helicopters have climate control. 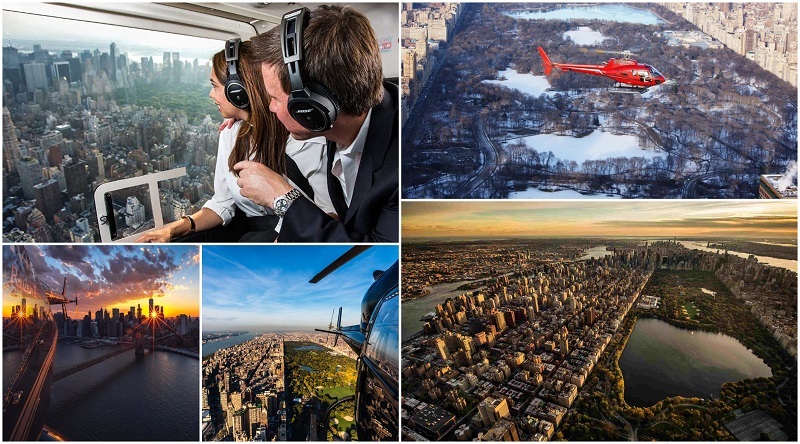 Pilot/guide; Private helicopter tour of NYC; Champagne toast (minimum drinking age is 21). Are you interested in aerial photography? If you are, this is a perfect tour for you. Head to the Westchester Airport in White Plains, and get ready for a flight over New York’s fascinating landmarks in an open-door helicopter. Whether you are an amateur photographer or a pro, there’s no way you’ll be indifferent. Soar above Central Park, Chrysler and Empire State Building, Lady Liberty, and any other attraction you want to photograph. If you want an experienced aerial photographer to fly along and share technical tips with you, you can upgrade. Flights are available from 7 am until 7 pm. There is also an option for hotel pickup and drop-off from Midtown or Uptown Manhattan. Have in mind that if you don’t follow the safety rules (legs and feet kept inside until the end of the flight) the flight terminates immediately. Also, your camera and smartphone must be secured by neck or wrist straps. Pilot/guide; Private aerial photography workshop; Experienced photography instructor (if option selected). If you want to experience flying the helicopter under the supervision of a flight instructor, head to the Westchester Airport in White Plains. First, you’ll have a briefing to learn about flying technique and safety rules. After that, you can access the controls and take off. You can try basic manoeuvres and enjoy sweeping views of Hudson River, Tappan Zee Bridge, Kykuit known as a Rockefeller estate, and Croton Point Park. However, you won’t be able to fly in NYC airspace because flying lessons are not permitted. Choose between 30-minutes or 60-minutes flight and whether you want to invite up to two passengers to ride along with you. You can also upgrade to include a pickup and drop-off from Manhattan. Whatever aerial experience you choose, you will not regret it. You’ll be in awe of all the fantastic attractions and views New York has to offer. However, if these tours are not what you’re looking for, check out other tours we have to offer.